Before and After Charging: On the left above was my initial charger installation with more work needed on the top to install an area light. On the right is how it looks after my wife came home and read me the terms and conditions. You can also see a bit of the decals on the car promoting fossil-fuel free driving slightly visible on the right. 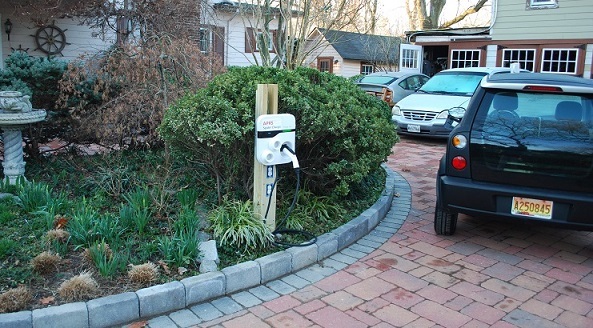 Hidden EVSE: The quick solution to the visibility of the EVSE besides staining the post brown, was to put the EVSE down in the basement and simply run the 4 wires of the J-1772 connector through the conduit to the post. I dont get to see the green and red lights on the EVSE, but I can see the ones on the EV and know if charging is going on. The post also supports a small 1 Watt down-facing LED bulb for better use at night. Wow, all this is harder to see than I thought. The J-1772 handle is also painted black and is on the far side of the post along with a lighter weight (but still AWG 12) cord that easily disappears into her weeds. I used a PVC plastic shower drain flange to hold the handle. You can see two of them screwed to the front of the original white EVSE when I was demonstrating it with multiple J1772 cords and called it a Spider Charger. THINK_City EV: Oh, also you will notice my 2011 THINK City EV restored from its BRICK condition when bought at auction (Mar-2015). Finally a real EV - My Volt: With now 6 years of used EV's now on the market place, in April 2017 the price of EV's were down to around $6k for Smarts, $9k for Leafs and about $14k for Volts. I snagged this one for $13k. The three year olds are all comming off lease and look brand new in most cases. This one had 56k miles on it and was perfect. 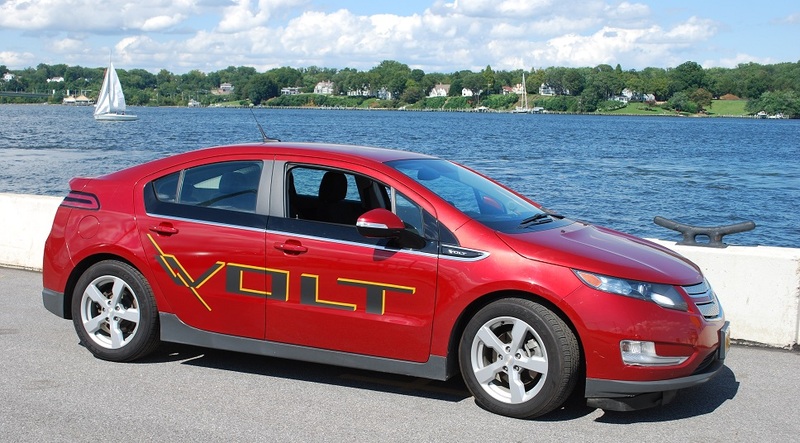 Then I trashed it up a bit with a very visible VOLT logo (I got the 2nd to last one in the country). It was too dark on a red car, so I added highlights with yellow electrical tape. Solar Prius at the Wash DC Auto Show. On return to the USA from Japan in 1980, I found an old Seabring Vanguard Electric City Car in the weeds behind a house in Greenbelt maryland. I restored it, and got it on the road. it worked well for my 5 mile commute to the Naval Academy in Annapolis, but when I moved in 1990 to a 15 mile one-way commute, the car could not make the round trip. Despite my 24 years of persistence against the bureaucrats at the Naval Academy, I still cannot get permission to plug the car into the standard outlet by my parking place and pay the approximately 60 cents for the electricity and the privilege. That battle continues even now in 2017! 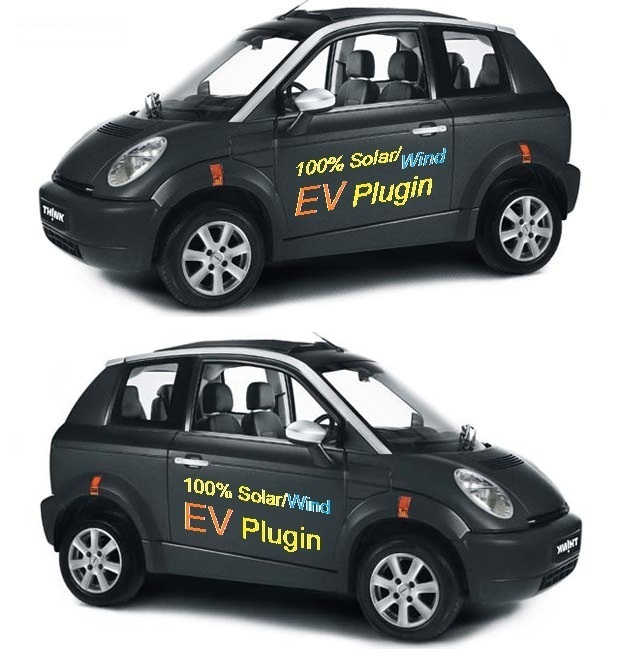 SOLAR-PHEV 2007: . Fortunately, I have lived long enough to enter the third wave of Electric Vehicles in America. In 2007 I added 18 solar panels to the roof of a salvage Prius shown above (damage hidden under the large white sign) to provide as much as 215 peak Watts or about 1 KWh of free electricity when parked for 8 hours in the Maryland sun. This is good for about 1 mile of electricity for each hour in the sun. . Where you live and the season of the year makes a difference as can be seen in the plot above of annual solar flux. But still, Maryland gets at least 75% of what they get in Arizona. SOLAR Energy and Charging: The solar panels on the car were a nice touch back in 2007, but as the cost of home-solar plumeted, it is far more practical to ignore the 15 sqft on the roof of the car when my house roof contains 100 times more area! So in 2010 my first 8 kW solar array in my backyard (photo to right of the first 2.8 kW) provided up to 10 KWH per day which is equivalent to about 40 miles on the road. But this project was mired in the mud for 2 years because of Maryland Department of the Environment rules against solar panels on piers or within 100' of the water. See Solar Laws headaches. Solar Update: By 2014, a large 18 sqft home solar panel cost less than a single 1 sqft panel on my car and efficiences are almost double. So, all my solar interests are now with the roof of my house, not the car. My home solar array is now up to 16 kW and producing electicity for half the cost of the utility. This powers all of my energy needs including my house, my heatpump and AC and my electric car. This has reduced my fossil fuel burning from over 3000 gallons equivalent per year down to only about 300 gallons. That last 300 gallons is for the wife's Prius and occasional trips to the kids and Gramma's. Solar Prius - Power-to-GO: . The only real value of the solar panels on the car came from their portability. For daily commuting, they only gained 10% or less in MPG. But like all solar, the higher value comes when I am out of plug's reach of the grid. Solar Power portability gives peace-of-mind where there is no gas or plug-in electricity available. Or for 8 hours all day parked at work. See more about Prius Emergency Field-Day Power. As an aside, field work involves a lot of overnight accomodations in the Prius-Inn. See my Prius Inn accomodations for one. COST: . To fit the roof smoothly, the array was made up of about $2400 of small 12 volt panels to total to the 240V prius battery plus another $800 for the 18 added batteries. This was in 2007. It make no sense to do this now on the roof of the car when the roof of the house is 20 times more economical. But solar lasts a lifetime and so I enjoy having them there with the ability to power he car and camoping accessories anywhere and they are far more valuable to me than the $2500 back-seat- headrest-video displays other cars have to rot the brains of your kids! The point of solar is to reduce our dependence on foreign oil and get the added benefit power-to-go wherever I need it. 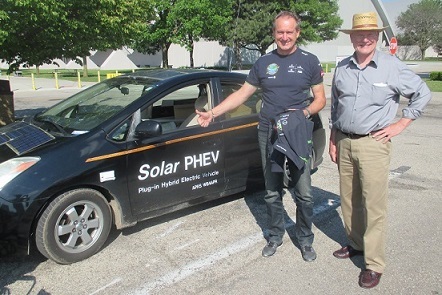 PHEV Conversion: . The primary purpose of the PHEV battery in this car was not so much for longer range, but to have a place to safely put the solar power without overcharging or over cycling the original Toyota HV battery. . The photo shows the added 9 Amp-Hour cells in the wheel. The circuit feeds current into the Prius to extend gas mileage but at a low enough rate (half hour) to not confuse the Prius computers. Also, the circuit prevents current from the OEM battery back into the PHEV battery. The only time the PHEV battery is charged is during regenerative braking, from solar power, and from over night plug in. The batteries are designed to be cycled to about 50% yielding a lifetime of about 2 years. A retro analog instrument panel was added to monitor voltage and currents and added a tach and vacuum gauge (missing in the original Prius). The left meter is 150 to 300 volts and the right one is -50 to 0 to +100 amps. . (click for full size image). The APRS ham radio with GPS below the dash provides tactical situational awareness of the positions, status and messages of similarly equipped mobiles in the surrounding area. The APRS network is linked to the internet and so you can always see where all the Hams are. 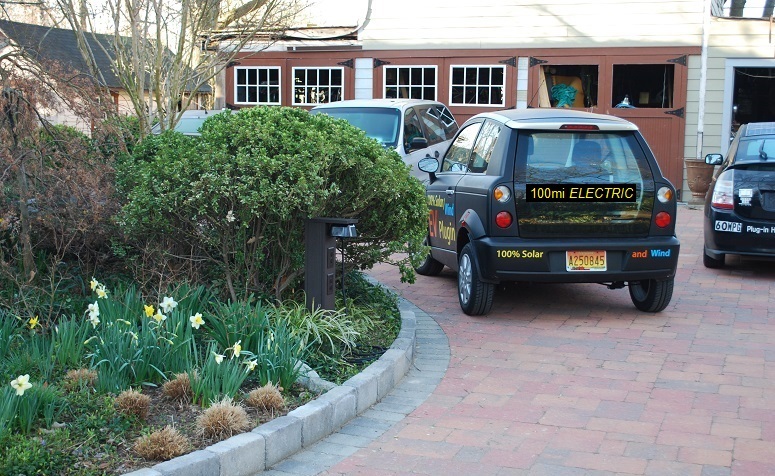 VEHICLE-TO-GRID: . Look closely over the shoulder of the T-shirt guy to see the portable electric meter that teh U-of-Delaware takes with them, because their Ebox can both SOURCE and SINK energy. This demonstrates the coming Vehicle-To-Grid technology which has great promise for meeting peak power demand.... That is, if 75% of the Vehicles in the USA were PHEV's, then the installed instantaneous POWER capacity in those 150 million cars parked all over the USA, represent FIVE TIMES the entire Electric Generating Capacity of all USA Generating plants combined! Solar Plane, Solar Prius, why not. During the Dayton Hamvention 2016, the round-the-world Solar Impulse landed at Dayton and I just missed the landing by 5 minutes. Then all weekend I tried to find out more info about when the plane would be avaiable for tours or to see it up close. I kinda gave up. Nothing seemed to be in the media. Then on Monday after all the hams had left I went to tour the Wright-Paterson AFM Air Museum and more or less had the whole place to myself. I could wander for 5 mintues or more and never see anyone else. Then I saw two guys in flight suits talking in French ... 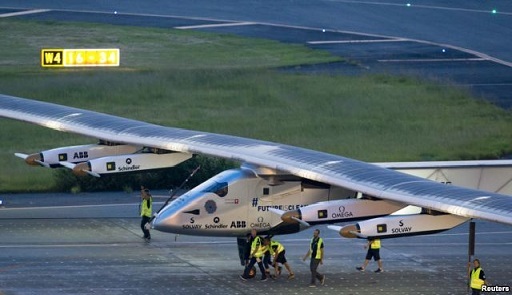 I thought they migth know soimething about the Solar Impulse. Maybe they were part of the travelling entourage groud crew. Then I began to wonder... and wandered back. "You guys aren't the pilots are you?" and one said, "yes, I'm Andre Borschberg." After picking myself up off the floor, I stumbled through something about how admiring I am of their solar initiative and how great their mission is, etc. Gushing along I said something about being 100% solar myself at home and driving an EV. He lit up and asked "That's not your red Tesla in the parking lot is it?" I said, no, mine is the beat-up Solar Prius about 10 cars down. He responded "Wow, I saw that one and we took pictures of it!" I gushed some more and then slinked away so as to not sound like too much of a solar groupie... Then I began to realize that if Andre saw my car on the way in, then he would be passing it on the way out. After another hour or so of touring the museum they headed out and I was able to get to the EV's first and I asked Andre for a photo, and he was happy to oblige saying something like "solar Impulse... solar car... good idea"... His camera man asked me some details about my car and as he and Andre walked off to their van, I could see the camera man passing along the details to him.